This work is one of the most famous in the work of the British, who was not only an artist, but also a writer and translator. The Annunciation is one of the most important events and festivals of Christianity. An innocent maiden named Maria took a vow of lifelong celibacy and chastity and led a godly life. So pure and blissful that God gazed upon His child and decided by His grace that she would be the mother of Jesus Christ, the Savior of the world. The Lord sends the Archangel Gabriel to earth to tell Mary this good news. This plot is depicted on the canvas. Despite the fact that the picture is one of the most famous works of the master, it is rightfully recognized as a masterpiece, as mentioned above, in the 19th century it was very sharply criticized, not every painting was met with such a condemnation. This is due to a deviation from the canonical laws: we see the frightened Maria, moving away from Gabriel, who thought, perhaps, that this “man” wants to encroach on her honor. It is believed that Mary, who prayed during a divine manifestation, rejoiced with inexpressible joy, but she was not afraid at all. Therefore, this image and criticized. However, the rest of the artist observes certainty: the color scheme is simple, but enough to convey the solemnity of the moment. 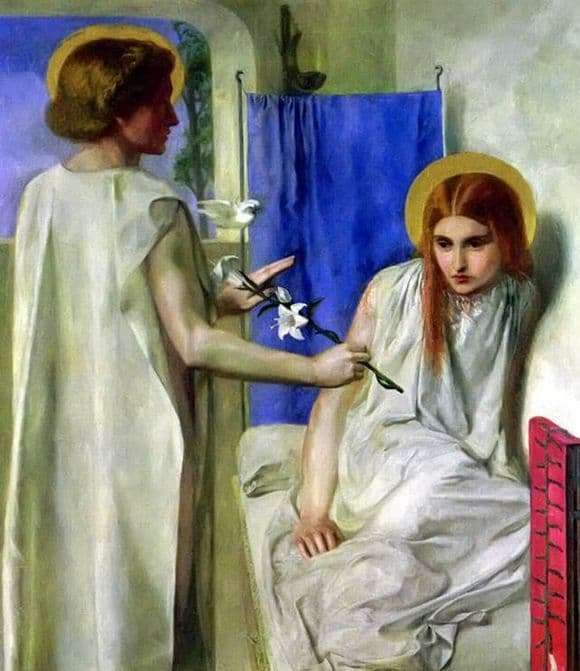 Lily in the hands of an angel, as well as white robes – a symbol of purity and purity. A little blue on the canvas is peace and tranquility, because it is the color of the sky, where the herald came from and where the Lord lives. And very little red symbolizes the death of the future child of Mary – Christ. Thus, this masterpiece embodies not only the joyful news of the birth of the Savior, but also the sad news of His death on the cross. That is why the picture met the strongest disapproval.